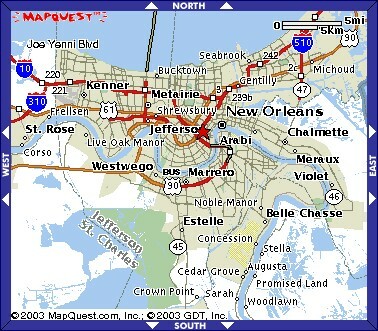 New Orleans is also known as the "Crescent City" because the Mississippi River forms a crescent shape as it passes through the city (see maps below). Did you know that the Mississippi River is about a mile wide as it passes through New Orleans! Now that's a BIG crescent! High level view of New Orleans; you can see how the Mississippi River winds as it flows through the city of New Orleans and ultimately into the Gulf of Mexico. Lower level view of New Orleans showing the crescent shape of the Mississippi River as it passes through the city. 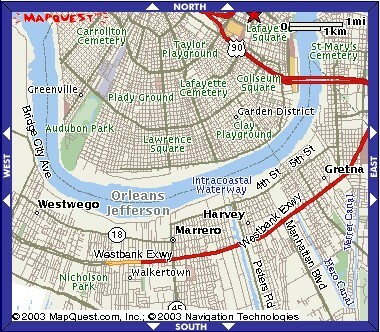 The Mississippi River is about a mile wide as it passes through New Orleans.